The first cases of Acquired Immunodeficiency Syndrome in the United States appeared in the early 1980s. A short time later, the 1917 Clinic at the University of Alabama at Birmingham opened to take on the disease. Now, 25 years later, the clinic is going strong and celebrating all of the birthdays achieved through its research, education and care. Saag went on to propose starting a comprehensive health clinic for patients with Human Immunodeficiency Virus (HIV) and AIDS. On January 28, 1988, the 1917 Clinic opened its doors at its now former location, 1917 5thAvenue South, with Saag serving as founding director. 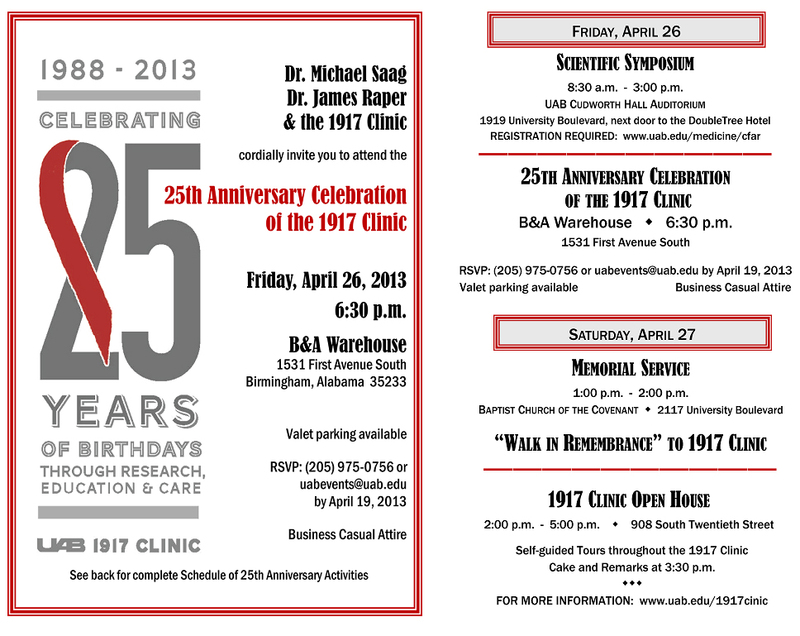 In observance of 25 years of birthdays through research, education and care, aweekend of events will be held starting with a scientific symposium on Friday, April 26, from 9 a.m. to 3:00 p.m. at the UAB Cudworth Hall Auditorium.